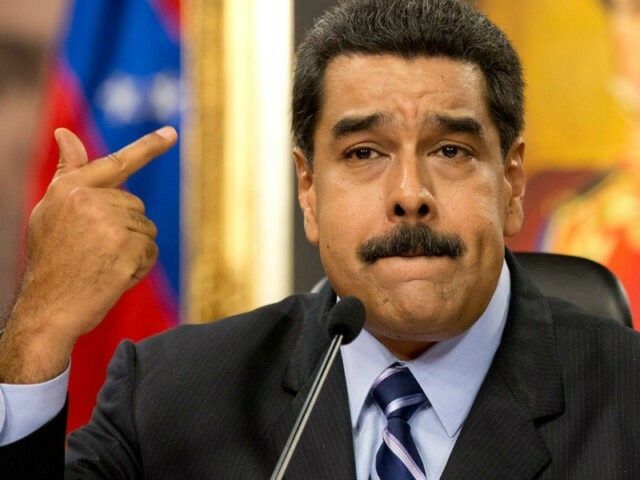 With the nation on the brink of famine, reports are surfacing that the socialist government of Venezuela may soon begin to limit the distribution of food in a town where protesters personally confronted President Nicolás Maduro, forcing him to leave. After the speech, Maduro took to the streets to greet supporters but instead found himself surrounded by villagers banging pots and pans and demanding that he leave. The protesters shouted, “we are hungry” and chased Maduro down a main avenue and, eventually, chased him out of Villa Rosa. Videos show the situation to be a chaotic one, with Maduro, in an olive green shirt, marching increasingly rapidly away from the angry throngs. One witness, speaking to the opposition-friendly newspaper El Nacional, says the president chose to approach the protesters later and personally tore pots and pans out of the hands of some protesters, “furious” about the public manifestation. Following the incident, the socialist government’s secret police (Sebin) arrested over 30 people and have since staged a forced “rally” in support of Maduro in the town. Olivares is referring to multiple claims on Venezuelan state media that the incident caught on video, showing residents jeering Maduro and forcing him out of town, never happened. The CLAP — the Local Committees for Supply and Production — are small groups of local Socialist Party leaders assigned in June to control the regional food supplies, delivering emergency packages to those they deem fit to receive them. A month after the establishment of the CLAP, the government placed the nation’s food supply in control of the military. Opposition members protested both moves, arguing that placing the little food the nation has in the hands of socialist partisans will force opposition sympathizers to be silent, or vocally support the regime they silently oppose, or choose to starve. The Villa Rosa report is the first incident showing the government using the CLAP to silence opponents by threatening to prevent them from acquiring food if they continue to publicly oppose the government. Venezuela is currently suffering a food crisis, unable to grow or import the food it needs for its population due to strict socialist price controls and the redistribution of rural land out of the hands of experienced farmers and into the hands of Chavista sympathizers over the past 17 years. While most of those arrested in Villa Rosa were released soon thereafter, some remain imprisoned, including a journalist the government accuses of initially alerting national and international media about the incident. Braulio Jatar, a Chilean-born journalist and human rights lawyer, remains in prison after being arrested following the anti-Maduro protest. The government is charging him with an unrelated crime: money laundering. “They planted $20,000 cash on Braulio Jatar to charge him with money laundering,” opposition congressman Jony Rahal said during a National Assembly meeting Tuesday. He did not provide evidence to back up his claim, but the government has also not issued a public statement regarding his arrest — Reuters reports only that his sister confirmed the money laundering charge.